Buyers and sellers participate in a market because they each benefit from doing so, and consumer and producer surplus provide a measure of their gains from trade. Here we show how to calculate the surplus mathematically, and prove that the competitive equilibrium allocation maximizes the gains from trade. We described the gains from trade in the market for bread in one city using Figure 8.9a, reproduced as Figure 1 below. The surplus obtained by consumers is represented by the area below the demand curve and above the horizontal line at the level of the market price. Producer surplus is the area above the supply curve and below the horizontal price line. The sum of these two areas is the total gain from trading in this market. 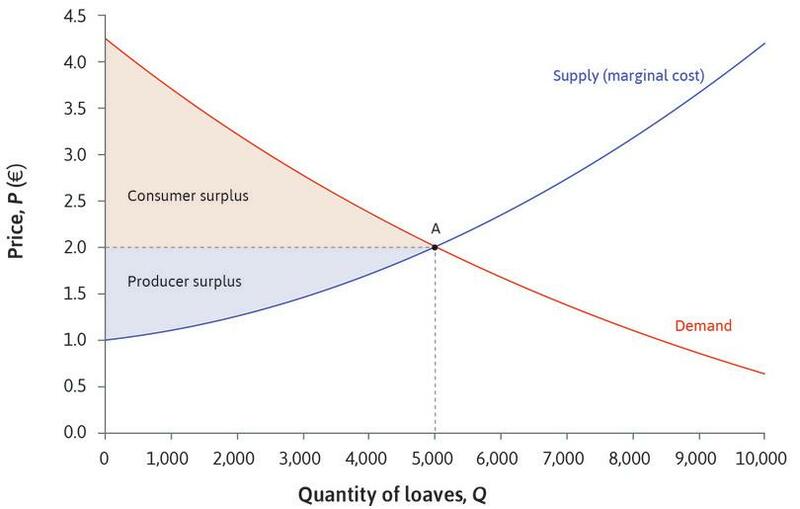 To determine the gains from trade mathematically, suppose the demand for bread is described by the inverse demand function , where is the price and is the number of loaves. Under the usual assumption that demand curves slope downward (the Law of Demand), is a decreasing function. Remember that the demand function tells us the willingness to pay (WTP) for bread. If consumers are lined up in order of willingness to pay for a loaf, then the consumer is willing to pay . Any buyer whose willingness to pay for a good is higher than the market price receives a surplus. If we suppose that the market price for a loaf of bread is , then the surplus of the consumer will be . In the diagram, this is the vertical distance at the quantity between the demand curve and the horizontal line at the market price. Equilibrium in the bread market: Gains from trade. Figure 1 Equilibrium in the bread market: Gains from trade. is a decreasing function, so is a concave function. We can calculate producer surplus in a similar way. Remember from Leibniz 8.4.1 that the inverse supply curve is the marginal cost curve from bread production in this market. If we let the total cost to bakeries of producing a quantity of bread be , then the marginal cost is is the equation of the inverse market supply function. by the fundamental theorem of calculus. This equation tells us that the total cost is the area under the marginal cost curve, for quantities less than or equal to . If were not zero we would say instead that the area under the marginal cost curve is equal to total variable costs—that is, total costs excluding the fixed costs which are incurred even if the bakeries produce no bread. Note that since is concave the second derivative of is negative, which confirms that this condition gives us a maximum point. This equation tells us that if the price is , is maximized when the quantity sold is on the demand curve at —that is, when all consumers whose willingness to pay is greater than or equal to participate in the market. If fewer consumers participate there are unexploited gains; if any other consumers bought bread they would receive a negative surplus, decreasing the aggregate consumer surplus. this equation tells us that is at the point where the inverse demand curve meets the inverse supply curve , the quantity sold maximizes the total gains from trade. Read more: Sections 8.4 and 19.1 of Malcolm Pemberton and Nicholas Rau. 2015. Mathematics for economists: An introductory textbook, 4th ed. Manchester: Manchester University Press.